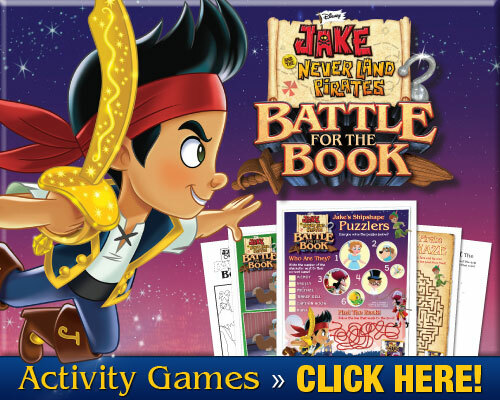 JAKE AND THE NEVER LAND PIRATES: BATTLE FOR THE BOOK is a value-packed DVD with great episodes featuring the Battle for the Book! adventure plus 4 additional episodes, for two hours and more of awesome packed adventures and fun! Have fun with your little explorers as Jake and his band of friends battle the bad intentioned Captain Hook in the effort to Save Wendy’s Storybook and with it, the Story of Peter Pan! Check out this fun activity set for Jake and the Never Land Pirates fun things to do! The 1-Disc DVD includes a free checker board bandana with gold coils for the pieces. It is packed inside each video box for that bonus treasure! Runtime on this film is about 141 minutes creating a lot of fun times for your little pirate. Rating is TV-Y for all kids, old and young. We were provided with a video for sharing.